The advertising shift from toys and gadgets to fitness memberships and diet plans is a predictable one this time of year. It makes sense. My indulgent eating over the holidays not only impacted my waistline, but my immune system, too. Now I find myself starting out the new year with a stuffy nose and raspy cough. I didn't always make the connection between what I eat and how I feel. All my life I've enjoyed food, and while I've always eaten vegetables, I would freely partake of junk as well. When I found out I was pregnant I suddenly felt a great responsibility for my health. I realized that now I was nurturing two bodies instead of one and I began to make a shift in my eating habits. This burden has continued now that I breastfeed my little girl; she receives nutrients that I put into my body. She is also starting to share what we have for dinner. I still have a long way to go in cultivating a healthy food culture in my home, but so far I think the key for me is balance. There is no way I will ever eat a salad for every meal, nor should I. Today I'm sharing a simple comfort food recipe that will fill you up with beneficial nutrients and satisfy your taste buds on a cold winter's day. Preheat your oven to 425 degrees. Scrub your vegetables well as you rinse them if you want to keep the skins on like I did. Cut the veggies into fairly even pieces and toss with EVOO in a bowl to coat evenly. 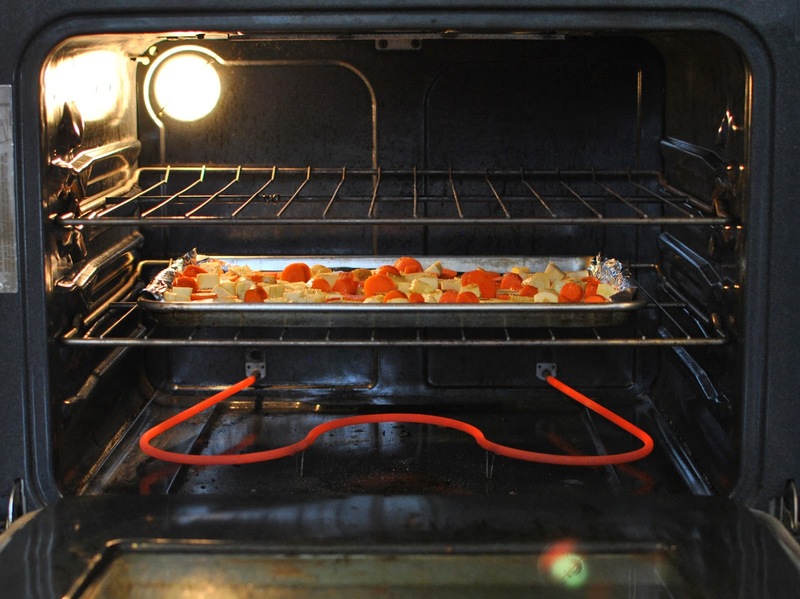 Put some foil on a baking sheet to make cleanup easier, then pour your veggies on. Spread them out so that they are not on top of each other, then salt and pepper them. Throw them in the bottom rack of your oven for about 30 minutes, or until edges are brown and middles can be cut with a fork. 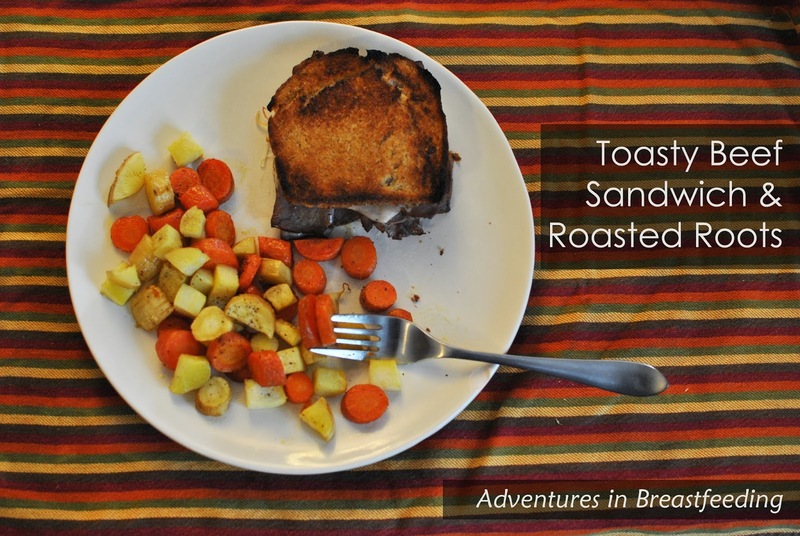 While the veggies are cooking, line another baking sheet with foil and assemble your sandwich. If you have roasted garlic on hand (which you always should), use the oil that it's packed in to spread on each piece of bread. If not, just use EVOO. Put one piece of bread oil side down on the foil. 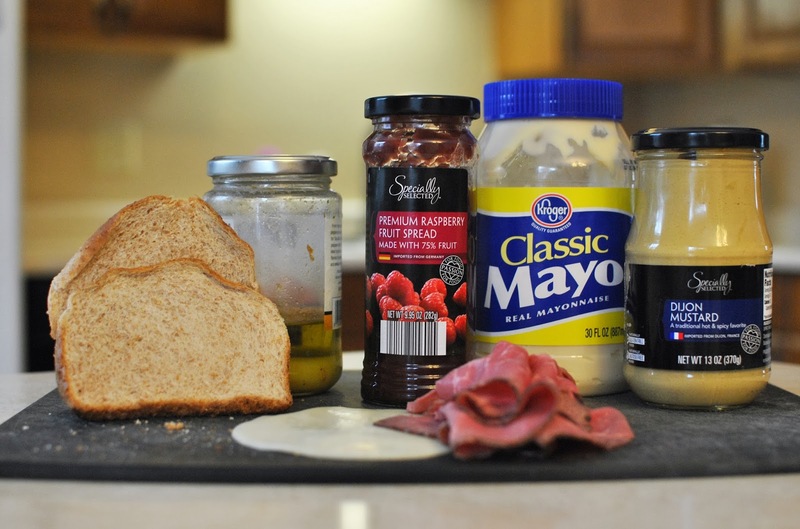 Spread this piece with mayo, then dijon, then raspberry jam. I know this sounds weird, but it is marvelous. Trust me. Top that bread with your deli meat and cheese and any other delicious add-ons you'd like: caramelized onions, bacon, etc. I like to put the other piece of oiled bread oil-side-up next to it so the cheese can get melty faster. I realize this is not an earth-shattering recipe by any stretch of the imagination. I didn't include amounts in the ingredients because I estimate. The carrots and parsnips pictured made two baking sheets of roasted vegetables. I like to make them all at once and keep them in the fridge so little Boo and I can have them for lunch all week. I also like to switch up the sandwich and veggie combo. I'm crazy about this peanut butter bacon sandwich or sometimes I'm in the mood for turkey and avocado. I love to use beets, squash, or sweet potatoes for the vegetables as well. The point is, you can have your veggies and comfort food and use your own favorite stand-by ingredients to eat well and feel well. I love having a full belly and knowing I'm nourishing myself and my daughter with vital nutrients. Happy New Year, and happy eating!